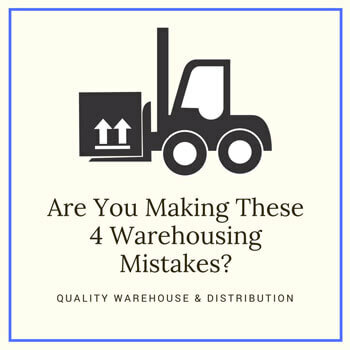 Are You Making These 4 Warehousing Mistakes? Storing too much inventory. While excess inventory may seem like a great idea for a warehouse, this may actually be its Achilles heel. Large purchases due to high-bulk savings may seem like a fantastic idea at the time, but storing 20,000 items that fail to move from the shelves proves that sometimes a sale isn’t always worth the purchase. Taking up space to store these “bargain” items may prevent you from storing inventory that will actually sell in the future and, instead, winds up wasting valuable shelf space. Considering the item itself when making these purchases is crucial to preventing this type of situation. When making large purchases, be sure that the inventory won’t sit around and take up space, and if you aren’t entirely sure, it is always better to air on the side of caution now than to choke on a write-off later. Buying equipment versus renting. This may seem like an odd notion to some, but owning equipment, such as a forklift, may not always be the best route in the long run. While a new forklift will run efficiently and cause very little concern, later down the line maintenance and age may result in more money spent and possibly even wasted. While owning this machinery may seem easier, renting will allow you to always choose the finest models available without the concern of storage and maintenance fees. If you are wondering whether renting is the right decision for your warehouse, the Forklift Center offers a list of advantages and disadvantages of both purchasing and renting. Paying little attention to the layout. Although the layout of your warehouse may seem insignificant, it sets the tone for the way the entire operation will operate. The space of the receiving area, the layout and spacing of the aisles, and the defined warehouse segmentation are all factors to consider when designing the layout of your warehouse along with several others. Adaptalift has developed a list of several items to consider when designing the layout of your warehouse. Rushing the goods in process. Processing goods into the warehouse is an everyday activity that may seem mundane at best. However, miscounting, overlooking items, and various other mistakes result in a loss of inventory that could add up over time. The key here is to properly train each warehouse representative involved in the goods in process and stress the importance of added focus. Taking the time to ensure staff members are taking this aspect of the process seriously will ensure that goods are accepted into the facility accurately and tracked better.